Easter Blessings. I don’t have cute newly hatched chicks, but I had this photo of newly hatched alligator babies, scales rather than feathers. In my town we have small peepers and tree frogs singing now, and not an alligator around for 1000 miles. these alligators were photographed in St.Petersburg Florida, at Sawgrass Park. I’ve been in self retreat mode for a few days, and as began to re-enter the world of more activity I was kickstarted by the wonderful news that I’ve won a scholarship to spend a week at The Fine Arts Work Center in Provincetown MA. Yay, and a big thank you to them. http://fawcsummerprogramshare.org. 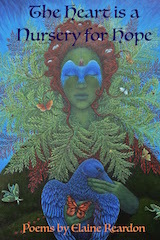 I’m also very appreciative of a wonderful review here: https://poets.media/blueberry-fresh-poetry – Please visit Berry’s Poetry Review website. At the State House in Boston there will be a gathering, and on April 24th they’ll be a commemoration at the Boston Armenian Heritage Park, near the North End. https://www.armenianheritagepark.org. I find myself thinking more and more about the women that preceded me in late winter when I’m more introspective, and Easter is coming. My great-grandmother Hripsome/Rose, with my grandmother, Mariam, and baby Aunt Sitanosh (Lilly). I remember our cooking and great family celebrations. I remember how close I felt to my great aunties and great-greats, hearing stories of them. What brought us together was the beaten up old kitchen table. It was still in the kitchen until I was in high school, and I learned to cook on it. My grandmother pulled a stool up to the table, wrap a huge apron around me, and give me my own small basin of kufta to mix. She’d show me how to roll sarmas, but mine were never good enough to pass muster. When my parents married, it was a cultural stretch, an Irish, Armenian, English speaking household. My dad moved into the house with everyone else, and there we stayed, an extended family, which was great for a kid, most of the time. This poem is dedicated to my Hye/Armenian ancesters, and all Armenians, especially Sahagians and Harootunians. bought phyllo paper-thin sheets from Sevan’s Market in Watertown. This final photograph is of Father Kevont holding me. He was my grandmother’s cousin and had also survived the genocide because he was at school. The rest of his family was gone, and the monks at his school reared him. He became a traveling monk and traveled the mountains with a donkey. I once saw a photo of him as a young man. By the 1950’s he found my grandmother and some of her siblings! They had been separated for so many years. I was too young to know the particulars, but he worked and lived at the Vatican then. When he brought young priests to the United States, he’d come to visit us. Cooking traditions are passed from each generation around the table. For Armenians, food is nourishment for the heart as well as the belly. When I begin to mix up some cherog dough, or when I make paklava, I feel close to my ancestors, and I can still hear my grandmother’s voice in my ear. Sometimes I find that I’m 4 years old again, standing on a stool at the table, pressing down hard on the walnuts with the rolling-pin. The small towns that perch on hills, both sides of the Connecticut River Valley are called hilltowns. Each small town has it’s own flavor of uniqueness, much like our local ice creams and CSAs. Each has a set of weather that’s dependent on altitude and amount of forest. We have a snowstorm while the valley has rain. We are at least 5 degrees cooler than the sea level towns in summer. Leverett is close to Amherst MA, home to well-known colleges and universities, Emily Dickinson, and a much larger population than the surrounding towns combined. We visit each other’s towns in order to partake in it’s offerings, and Leverett offers some unusual gifts. First of all, it has a food coop so you can buy groceries, coffee, lunch, jewelry, and similar items. On Fridays you can pick up a pizza for supper, fresh from the bakery here. If you’re considering more spiritual sustenance, drive further down the road and take a left onto Cave Hill Road, where you’ll find the Peace Pagoda. It’s the first Peace Pagoda built in the United States and was completed in 1985 with the support of worldwide volunteer labor. You’re welcome to walk, meditate, and contemplate in the garden. When you leave the Peace Pagoda and turn left at the end of the road, find the old Box Factory on your left. It’s resurrected as the Leverett Crafts and Art Gallery, a place to take courses and workshops in many disciplines, to visit artist’s studios, and to see what’s up in the Barnes Gallery. Louise Minks has a studio and teaches painting here, Vermont, New York, and Taos NM. This is Louise, below. What are some of your favorite places near your home? Share in the comment section below. . I’d love to hear from you . French King Bridge crosses the Connecticut River. Here the MIllers River runs into it. Route 2 travels past the North Quabbin towns and crosses over Connecticut River in Erving MA. Although Route 2 is the only major east/west road, it only has one lane going in each direction. For over twenty miles it closely follows the Miller’s River, which flows into the Connecticut River. Route 2 was originally a walking trail used by the Native Americans, and it’s called The Mohawk Trail in this area. Out further west, it wasn’t paved until the 1920s and wasn’t passable in the winter. spoiled for choice: Which state forest to visit? Route 2 takes you through the center of Erving. Shortly after entering Erving, you’ll notice this sign. Bart’s is locally made ice cream. They also serve a local brew coffee, huge delicious sandwiches, home-made pies, and scones so good that they made Yankee Magazine. If you’re looking for a gift or some sweets, pull into the next establishment, Erving Station, a homemade candy shop. Just in time for Easter, they have hand made old fashioned sugar eggs, as well as very delicious chocolates and other treats that you can see them making if you peek into the kitchen area. ervingstation.com Do you have a favorite off the beaten track you’d like to recommend close to your home town, no matter where that is? You’re welcome to share below, in the comments. The North Quabbin area is often called The Accidental Wilderness. Greenwich, Enfield, Dana, and Prescott are four towns that were settled in the 1700s in the Swift River Valley. This area was chosen as a perfect area to flood to make a reservoir for Boston and outlying communities as they needed more water. The towns were leveled. People were moved out, trees cut, cemeteries moved, and railroad lines stopped running. There was a lot of heartache and memory that’s still left in the region. In the 1930s the work began. The Windsor dam is on the southern end, and the high hills are now islands. In 1946 the valley, now a huge lake, was considered filled. You can now walk on roads that go right into the water, find small stone bridges, some roads that allow biking The Quabbin is part of a greater wildlife corridor that extends to the north. We often have strong familial ties to our neighbors and may have their house keys for emergencies. We celebrate each other’s successes, small and large, and we are like an extended family in many ways. One place that celebrates this sense of extended family within a larger community is in Petersham. The Petersham Country Store is right on route 32, across from the town common. Several times this season I’ve gone for lunch, meeting friends from Petersham. But when I’ve gone in, I’ve found five or six people from my own town, Warwick, having lunch there as well. It’s such a great spot for healthy, tasty food that it’s lunch we’re happy to drive 20 miles to have. There’s the added benefit that if we are feeling lazy or want to eat too many things, we can pick up prepared food from the refrigerated shelves to take home. We also know everything is made from scratch by people who are on the other side of the counter. The last several times I’ve visited, I’ve seen a meeting of folks from Harvard Forest, another meeting of folks from a local land trust, a group of women hooking carpets, and meeting earlier in the morning, a weekly gathering of knitters. Folks leaving the local Buddhist retreat centers, five miles down the road in Barre, often stop here, too. What supports you in your own community? Are there particular events your town holds that you look forward to? I’d love to hear from you about where you live, and what nurtures you. The link above takes you to where all profits from the book will go, if you’d like to know more, or just donate to them. The book is just off the printer’s now, and the official party launch a bit further in the spring.I’ve a short story and several poems in this anthology, and I’m in good company. While it’s available locally in Dublin, it’s also for sale at amazon.com. All profits go to the homeless shelter. What could be better than using art this way. Every October in Warwick we have a top notice pop up art show. Anyone in Warwick or surrounding towns can put all manner of crafts or fine arts into the show. We have beginners, kids, to top-notch artists that show in New York City and have their work hanging in galleries. This was my corner last year. The evening begins Friday night with wine flowing freely, and ends with Beth’s incredible chocolate mousse. You’ve never seen such an enormous bowl of mousse. You could bathe a baby in the bowl. During the winter the town hall turns into a dance & music hall once a month. Again volunteers cook. One month it’s Super Bowl, with soups and homemade bread and desserts, then music and dancing begin. The next month its pizza, and in March it’s a St. Pat’s type of supper, and the music rocks out. Of course, volunteers cook and clean up. Many people pitch in to fold up the tables and chairs after the meal. Last year one of the events happened during a winter storm, and the electricity went out all over town. Clean up couldn’t happen until the next day. But the band played on, unplugged, and people that lived close by went home to get lanterns and solar lights. Sometimes we’ve had movies at the town hall, complete with popcorn. So many of us go because we are thrilled not to have to drive 20 miles or more to see a movie. Our local church is open for yoga class, meditation, and a variety of discussion groups. This fountain in front of the library? People come from a distance to fill up water bottles. The water flows straight off Mount Grace to the library and a couple other buildings. When we lose electricity, many of us meet here when we fill bottles of water. People also gather at our library on Saturday mornings. The library serves coffee and homemade snacks each Saturday, and it’s got an early crowd, and the after yoga class crowd. People wander in to buy trash bags, to find books and use computers, and to have their kids play in the kid’s section while they catch up with friends. It’s also a place to solve problems since there are so many people gathered. Last week my friend Jim called me over to chat with me and included Greg, a local carpenter. Jim has looked over a repair job and thought Greg could help out. We ironed out a few ideas and even included my friend Lisa, who stopped by and had some ideas. Not only did I leave with a few books and a great cup of coffee, I now was on the road to having a contractor come to visit. This is the stuff that happens in small towns, not to mention the great walks through the forests and swimming in the ponds once summer comes. 2019 Annual Student & Teacher Show! A vibrant show of work by about 20 students and Louise Minks! I’ll have 5 pieces in this show. If you’re local, please drop by.